Thunderstorms couldn’t keep me away from my kitchenette. In fact, it was the opposite. You see, rainy weather lures me to my cooking range. And, that’s what it did this evening. Originally, I was planning on Chinese delivery; however, my culinary mind sent me searching for supplies (well, food). Eggplant parmesan was on my mind. However, I didn’t have the cheese of the hour. Moreover, there was no fresh basil. I did not allow that to damper my dish at hand. 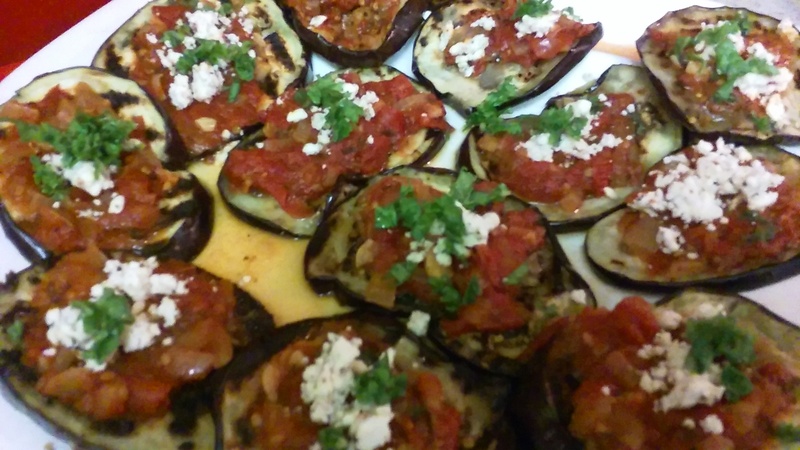 Decided to improvise and made my style, Eggplant with Feta cheese. Bought the cheese on sale for sometime; maybe a couple of months and stored the reserve in the freezer. 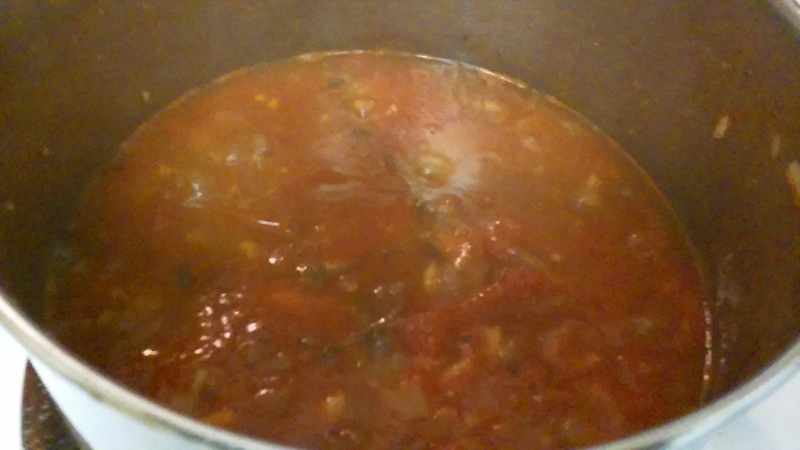 First, I made a home-made tomato sauce with my vine-ripe tomatoes. I softened finely chopped onions in olive oil. 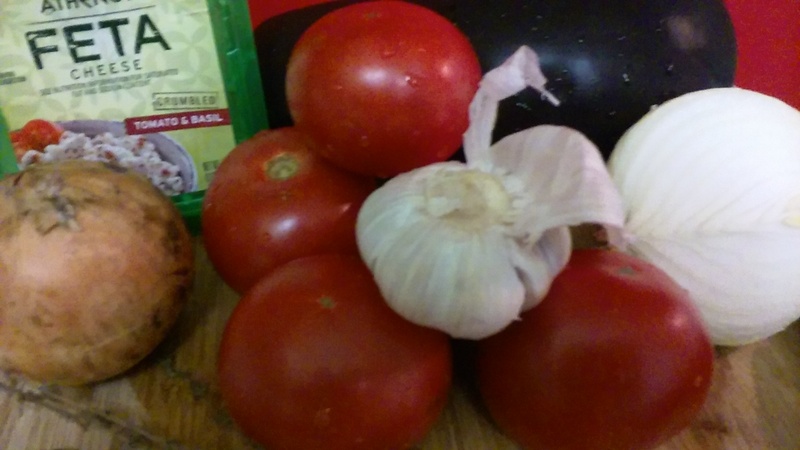 Then, chopped tomatoes, crushed garlic, thyme, dried basil, oregano, salt, black pepper, squeeze of honey and a splash of red-wine vinegar were added. I allowed these ingredients to simmer on low heat while I attended to my purple boy. 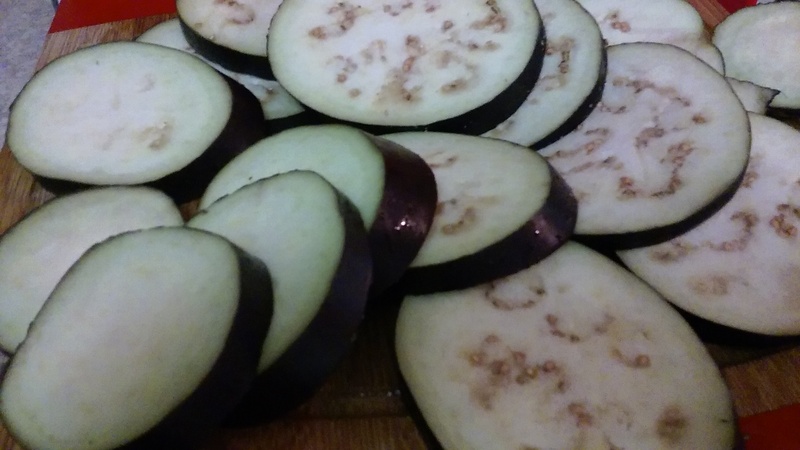 Grabbed my chopping board and went to ‘town’ with my big purple boy (eggplant). Slices were seasoned with a pinch of salt and black pepper. I fleetingly thought about placing them in an egg wash, sprinkle bread crumbs and pan-frying. But, decided to employ the use of my grill pan. This move (grilling) saved me quite a few calories from pan-frying. I was ready for action. 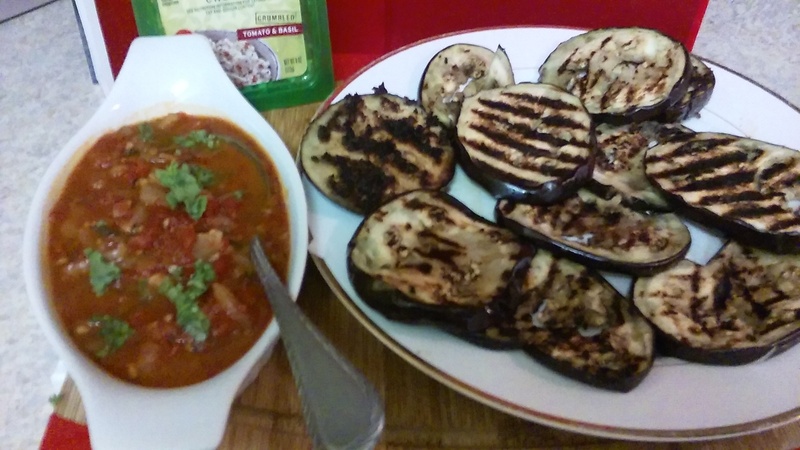 Grilled eggplant slices were plated and fresh home-made tomato sauce was spooned on each slice with a sprinkle of the briny feta cheese. Didn’t have fresh basil in-house. I didn’t allow that to rain on my ‘parade’. Instead, I used thinly sliced kale I had on had. I was super-happy. 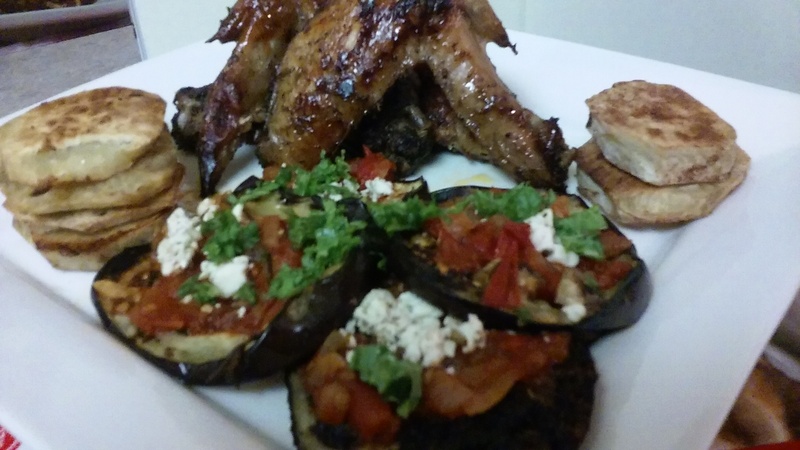 I served a few slices with a few roasted spicy jerk wings and sweet potatoes.